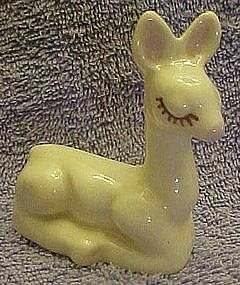 This adorable deer, we are pretty sure is made by Rio Hondo, but could have been made by Chic, Walker or Delee. The eyelashes and coloring appear to be characteristic of Rio Hondo ,but also looks like possibly could be one of the other companies of this time period. She measures 3 7/8" tall and is in perfect condition. She is solid & heavy.